Parasols are the best kind of unnecessary accessory purchase. Why? Count on looking fabulous opened above you like a prissy period reenactors with those lacy umbrellas, for one. (Is my posture holding a parasol better? Damn right!) The design on the parasol adds to the awesomeness, secondly. Thirdly, it provides just enough shade walking around on a sunny day unlike umbrellas used for rainy days. And lastly, it can be use as decor when it's not keeping you fabulously shady! 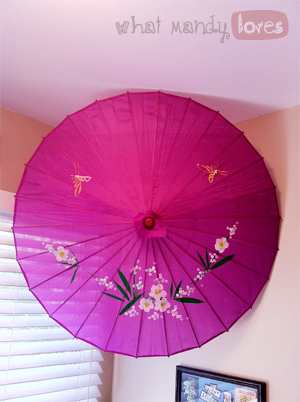 Hang an open parasol in a corner of a room. This particular parasol came from... I think the Carson City Rendezvous several years ago. I'm pretty sure that's where I pleaded with my mother to purchase it for my teenage self, but hey these things can be found anywhere. Dollar stores, Chinatowns, swap meats, thrift stores (albeit in not the best condition), and craft festivals supply all sorts of parasols. Just gotta know where to look. Mine hangs in the corner of my kitchen near the only window. (If you see a slight purple ting to a photo of mine on my dining set, it's this purple monstrosity's fault.) I used pushpins and strands of yarn attached to the base and the handle to create the angle you see below. How convenient that the floral design creates a SMILEY FACE, too! Finding faces in inanimate objects is one of my under-appreciated hobbies, so being able to hang up a smile I can see on the daily only makes my own face smile. 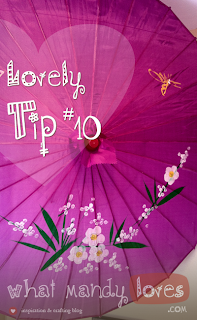 Do you have a parasol decor idea? What else do you use a parasol for? And what does yours look like (they're just so darn pretty, right)? Let me know in the comments.